KANSAS CITY, Mo. 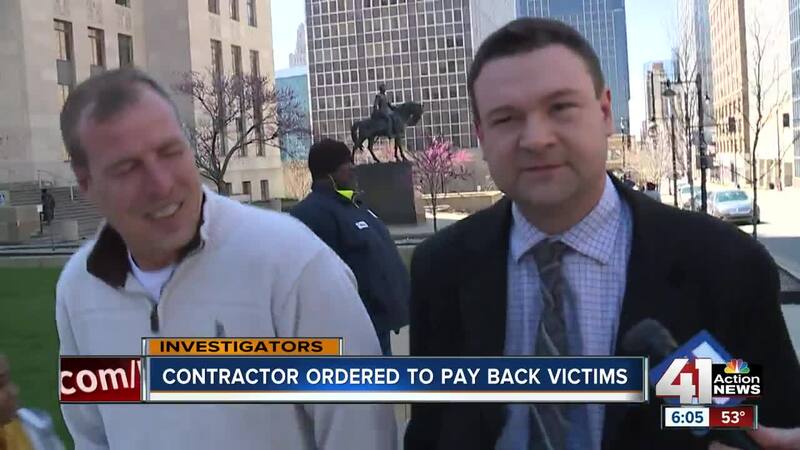 — A concrete contractor who has pleaded guilty to multiple felony counts in five Missouri counties in the Kansas City metro area has now been sentenced in all five of those counties. Bob Williams' final sentencing was Friday in Jackson County. Williams entered an Alford plea, which means he admitted there was enough evidence to convict him but offered no further admission. Jackson County Judge Jalilah Otto gave Williams a four-year suspended prison sentence and ordered him to pay $989.34 per month in restitution for the next five years beginning June 1. Williams has also been ordered to pay restitution as part of his sentences in Platte, Johnson, Clay and Cass counties. In some instances, that money has already been paid through bonds. But according to Assistant Attorney General Lynn Stoppy, Williams will owe more than $1,600 per month in combined restitution payments. Those combined payments include the Jackson County restitution, payments in Clay County and $280 in restitution payments already being made in an unrelated bad check writing case that the 41 Action News Investigators reported in January. Stoppy and Assistant Attorney General Jake Aubochon said that altogether, Williams owes customers about $100,000 for money he took for work he either didn't complete or didn't even start. The 41 Action News Investigators spoke to Eric Roby, Williams' attorney, as he and Williams left the Jackson County Courthouse after the sentencing. "Mr. Williams is going to do his best to do things right," Roby said. Williams did not answer any questions. When the 41 Action News Investigators asked Roby if Williams had enough income to cover the restitution payments, Roby declined comment. "I don't believe he'll be able to do it. I believe they'll see him back in court again," said Gail Yaw, a victim who first spoke to the 41 Action News Investigators in October 2015. She took out a loan and gave Williams $2,800 to do work on her Raytown home. But she said Williams never did the work. Since that time, Yaw has sold her home to pay off the loan. She drove eight hours from her new home in Minnesota to be in court Friday for Williams' sentencing. "I'm grateful to 41 Action News and also the attorney general's office for following this through to the end," Yaw said. Before the sentencing, Williams apologized in court and said he made unintentional bad business decisions and couldn't handle it all. Linda Platt, another Jackson County victim, attended many of Williams' court appearances in all five counties. When the 41 Action News Investigators asked Platt, who gave a written victim's impact statement to the court, if she believed Williams' statement in court Friday, she said, "Not one word of it." Otto, the judge, cited Williams' prior criminal history dating back to 1991 and called him a predator. "He is a predator and, unfortunately, I think the time he's continuing to stay out, he will continue to prey on people," said Karin Metcalf, another one of Williams' victims. Metcalf also gave a victim's impact statement in court before the sentencing. She told the judge that Williams took $8,750 from her in 2015 to rebuild a concrete walk at her home so her disabled mother could get in and out the house. But she said Williams never did the work, and her mother has been in a nursing home instead. If Williams pays all of the Jackson County restitution, Metcalf would have to wait nine years from when she first paid Williams to get all of her money returned. Otto said that if Williams is unable to pay restitution, she will have no other choice than to send him to prison.